Activation: selecting the macro icon from the taskbar (see instructions for placing the icon onto the taskbar below). This macro brings up the “ScorBox launch pad.” To work in ScorBox, you have to launch any of Score’s modules via this launchpad. The launch pad creates temporary tracking and launch files that Macro Express relies on in order to enable effective navigation and in order allow plug-ins and other processes to function. 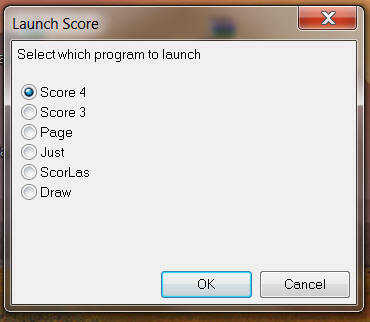 Note, therefore, that you no longer launch Score, or any other of Score’s modules, such as Page, Scorlas, Draw, etc. from a command prompt. You also don’t have to modify or create startup batch files; the DosBox startup process created within Macro Express sends the required information to DosBox. Secondly, create a Desktop shortcut for this macro. 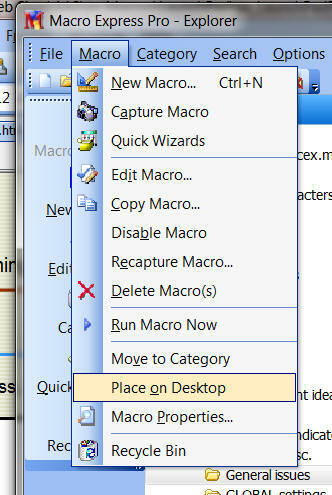 Select the macro, as shown in the preceding image, then go to the Macro menu, and select “Place on Desktop.” The shortcut to the macro will appear there. 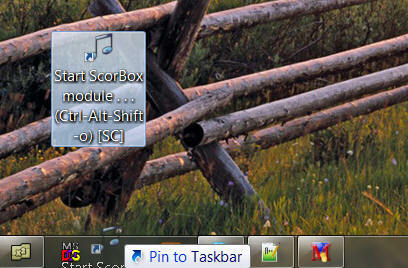 Third, take the shortcut that has been placed on the desktop and drag it onto your taskbar, placing it where you wish. NOTE: the launch options provided here are geared primarily towards Score version 3 and its associated modules. While I have Score version 4 and its associated modules installed on my system, I confess that I have never actually used it, and I know absolutely nothing about it: I admit that I have never been interested. (Well, I do have a “Score 4″ on my system, but it is a custom tailored version that Leland Smith created for me many years ago; it contains a number of upper parameters [some parameter items 21 through 26] and some other goodies not available in the commercial versions 3 and 4 – but this only as an aside.) I don’t know therefore if version 4 modules will launch and function as reliably as version 3 modules are; you should test that yourself, and you may wish to expand the launch options available within the launch pad. To do that, simply revise the existing macros to suit your needs. If you expand or enhance any of the launch modules, you may wish to upload them; please do so on the Submissions page. The support file “LastScoreModuleLaunched.txt” must be placed into your ScorBox support directory, as indicated in User variable “ScorBoxSupportFiles.” You need not modify anything in this file; it is dynamically updated. In a nutshell, this initialization file serves to pre-select a radio button in the launch pad based upon which module was launched the last time the launch pad was invoked. To view the ScorBox launch pad and the entire ScorBox work environment in action, have a look at the following video.